Mr. GDC works from home. He commutes to Houston for meetings, and visits with clients. Most of his time is spent here, at home. We chose a large room at the front corner of the house for his office space. The room is most likely the original parlor, with original pocket doors, picture molding, a faux gas start fire place, and 12 foot ceilings. It has great light, three tall Victorian windows frame two exterior walls. He has a view of our small front garden, he can watch the grey dove knocking about, unless that pesky black, and white spotted cat wanders past. Then, it's chaos. Mr. GDC's transitioned to working from home, came unexpectedly six years ago. In Austin, due to the unexpected change, he adopted our dining table, and room as his desk, office space. The French farm table served him well. Eventually, we shifted the guest room, to a work space. Upon moving to Galveston, we chose to change out the impromptu dining table, for a "real desk". 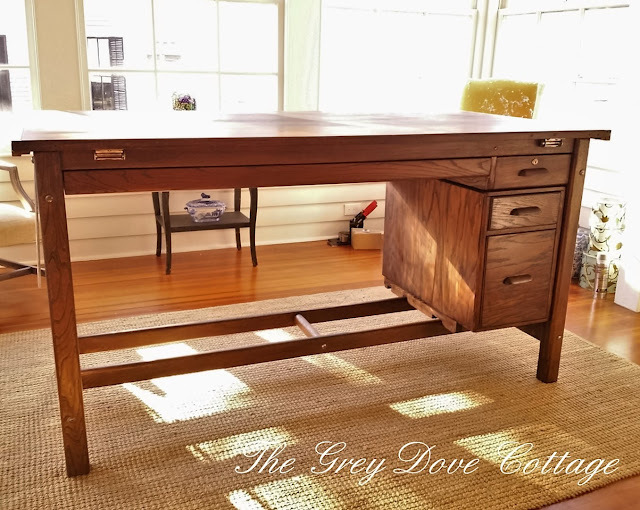 Mr. GDC's Austin Home Office, Guest Room with the French farm table he used as a desk. 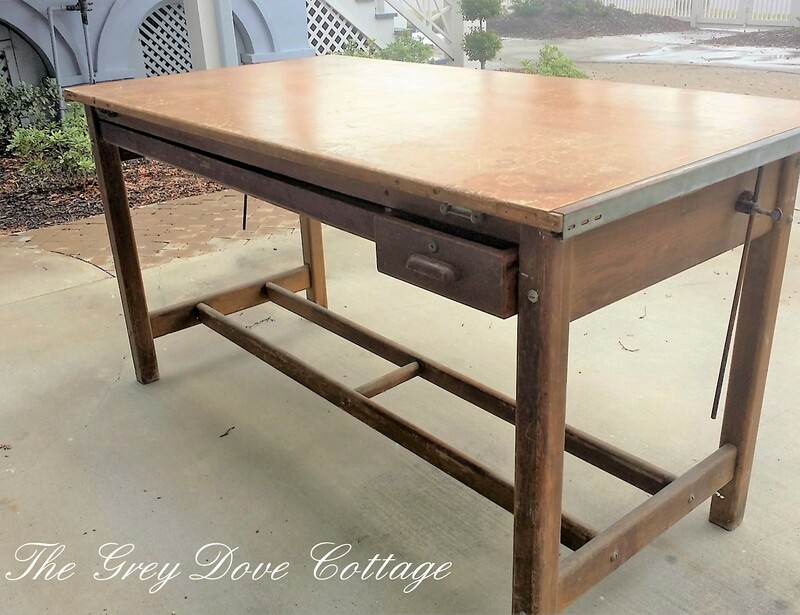 When looking about Craig's List, and Estate Sales, for a desk replacement, I happened upon a drafting desk. My days in interior design school, standing at my drafting desk, working for hours on plans, renderings, and concepts were happy days, and comfortable days. No back strain. Drafting desk are tall, if you get a bit restless, you can stand. Mr. GDC has "bad knees". Why do people say that? Obviously, his knees are not "bad", they are actually quite nice - they are getting old, as are we. 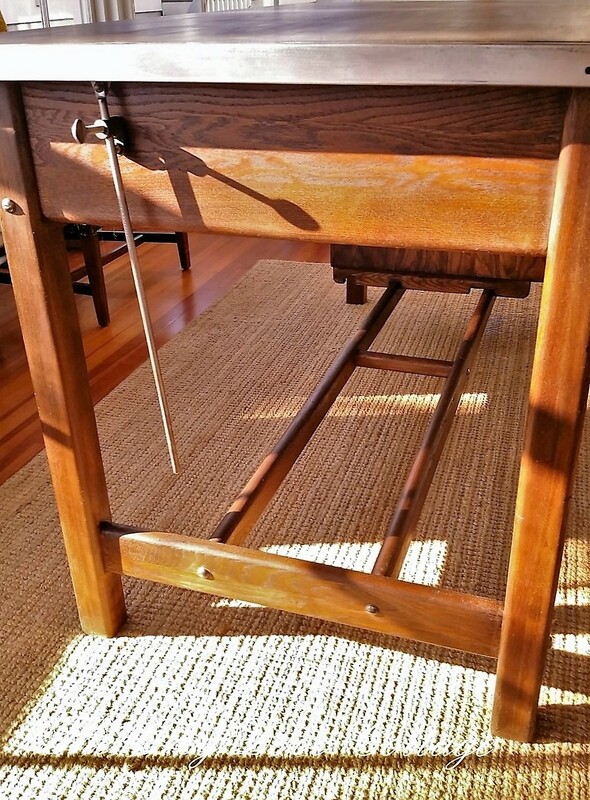 The up, and down, sitting hunched at the dining table, hour after hour becomes uncomfortable. Hello gorgeous! 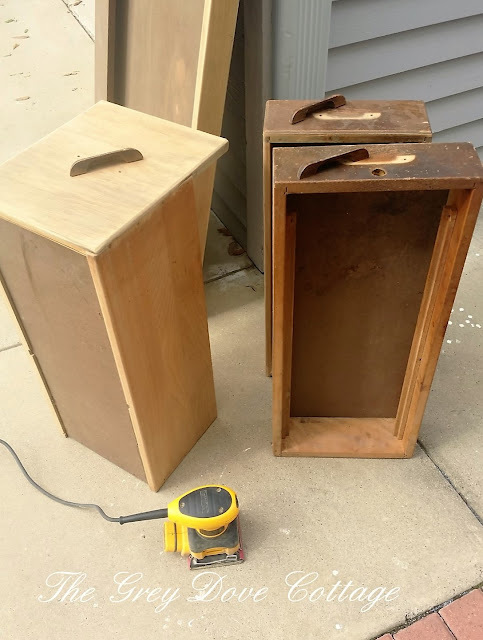 Well, maybe not gorgeous, but she will be - after a stripping, sanding, bit of glue, and tape, finished off with some stain, and few coats of sealant. What was I thinking? Romantic me struck again. Dare I say? 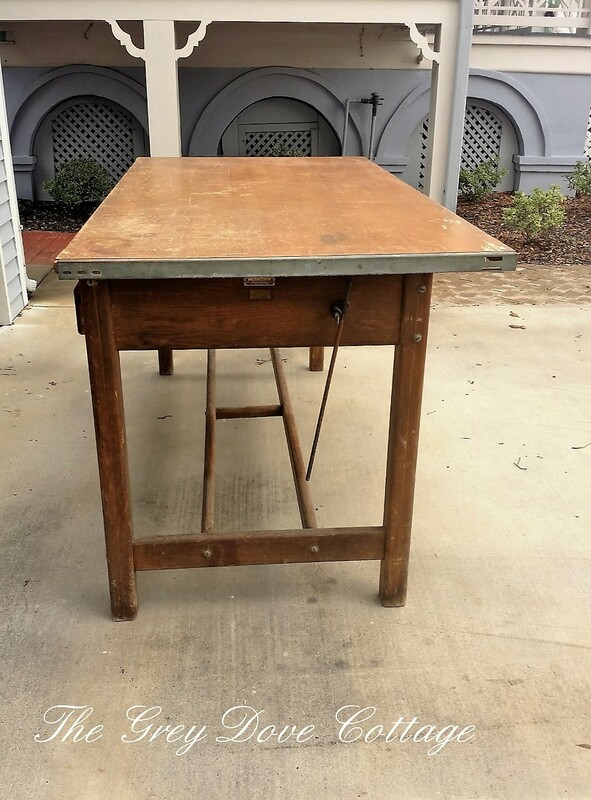 We'll get an antique drafting table. Yes, sadly, I'm that old, and been out of school that long. Antique. Although, I'm uncertain how "that" happened. 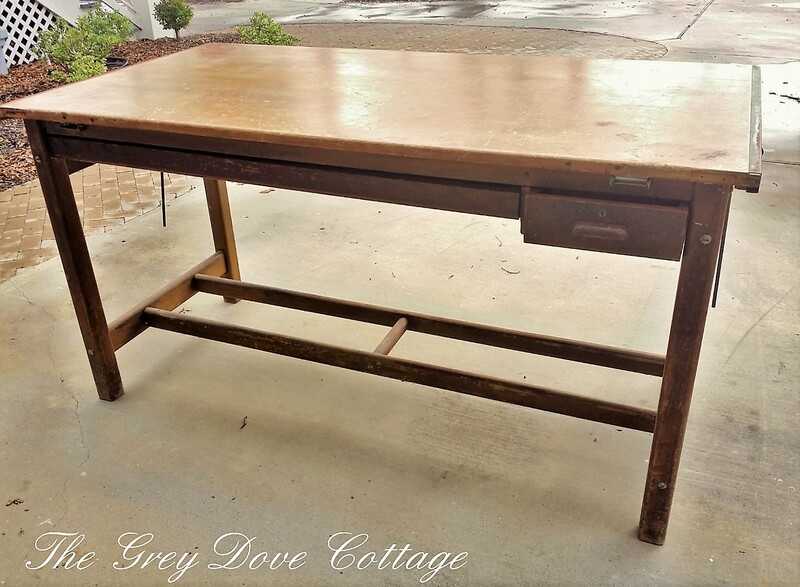 Our Craig's List find, an "antique" drafting desk, in need of love. The Gulf Coast area, as other coastal areas, enjoys high humidity; great for wrinkles, not so great for furniture. The table sat in a garage for a few years, resulting in humidity issues; peeling veneer, a bit of water damage to a drawer, rusty bits eating away the metal trim, screws, and hinges. It's previous owner, an architect, left the table to his grandson. Unfortunately, or fortunately for us, the grandson had little interest in it. A choice, I fear one day he may regret. If he kept my number, he can call me, when that someday arrives. We saved it for him. 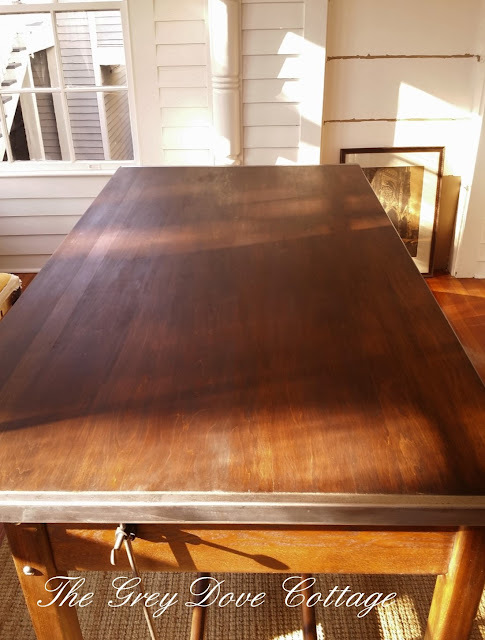 Table top, removed and sanded. Drawers were the most damaged; some had a bit of peeling veneer, some needed their dove joints glued. I sanded them carefully to remove the original finish, dirt, grime, and water damage, as best I could, then repaired the joints. If you look closely, you can see the veneer on the right side of the file drawer, hanging on by a thread. The file drawer stack was the most water damaged. At some point it must have set in a bit of water. Maybe Ike, years ago? 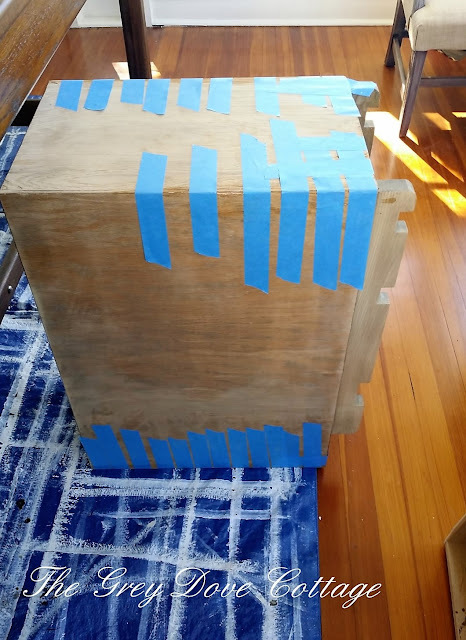 I pushed wood glue underneath the veneer, then taped it with blue painter's tape. Painter's tape doesn't leave a great deal of residue, it is perfect for a job like this. 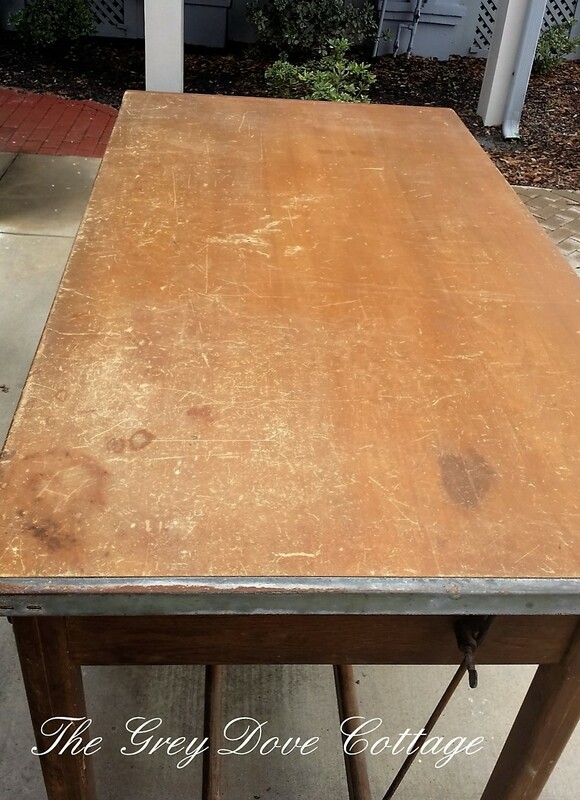 Residue would affect the stain coverage, causing the stain to "spot", rather than be smooth. 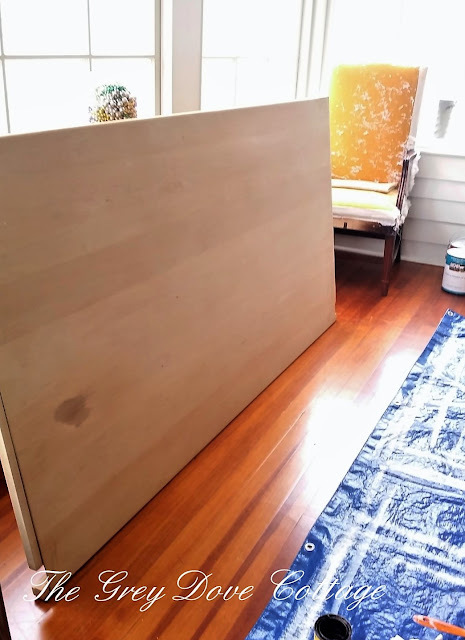 The veneer will have water damage, even after the careful sanding, and reapplying to it's plywood frame. A bit chipped, a bit wrinkled, it will be original to the desk. Being a bit wrinkled, and chipped myself, I'm ok with that. Minwax, "Special Walnut", is a favorite stain color for me. 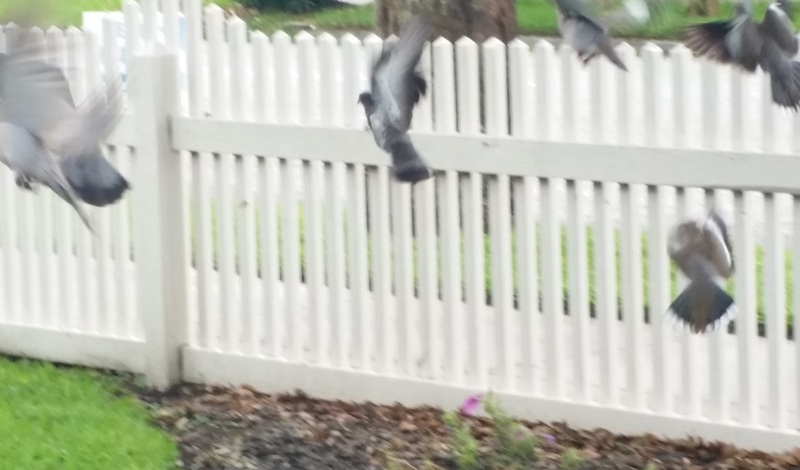 It is warm, with grey undertones. Not too yellow, not too red; I adore the rich color it gives various types of wood. 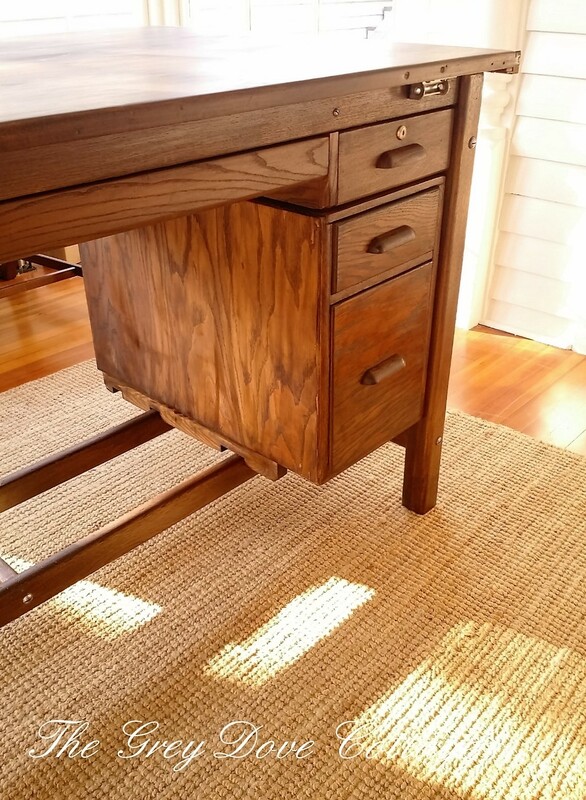 In this instance the top is pine, the frame, and drawers are oak. Different species of wood take stain differently. 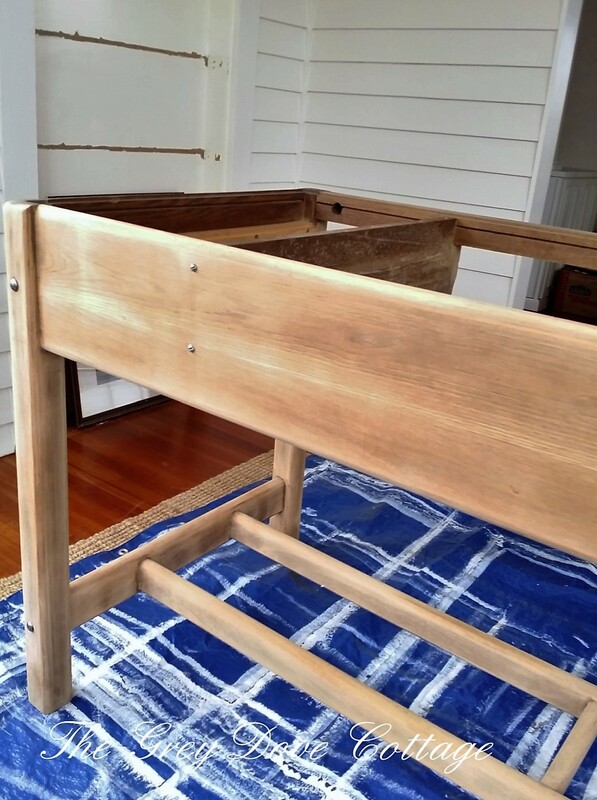 The top being pine, took the stain a bit more densely, than the frame, and drawers, making the top a bit darker. Mr. GDC took all of the metal bits; trim, edges, blots, nuts, and used a wire wheel to remove rust and polish the metal. If you fail to stop the rust, or remove it, it literally "eats" the metal, causing holes. Fortunately, we the metal is all in tact. The drawers sit upon a sliding rack, and can be positioned to the right or left of the desk. Mr. GDC is right handed, so to the right they rest. The veneer on the file drawer came out fairly well, a bit wrinkled, still. One of my personal favorite details in a drafting desk is the center drawer; shallow, the width of the desk, intended for T squares, triangles, pencils, and plans. 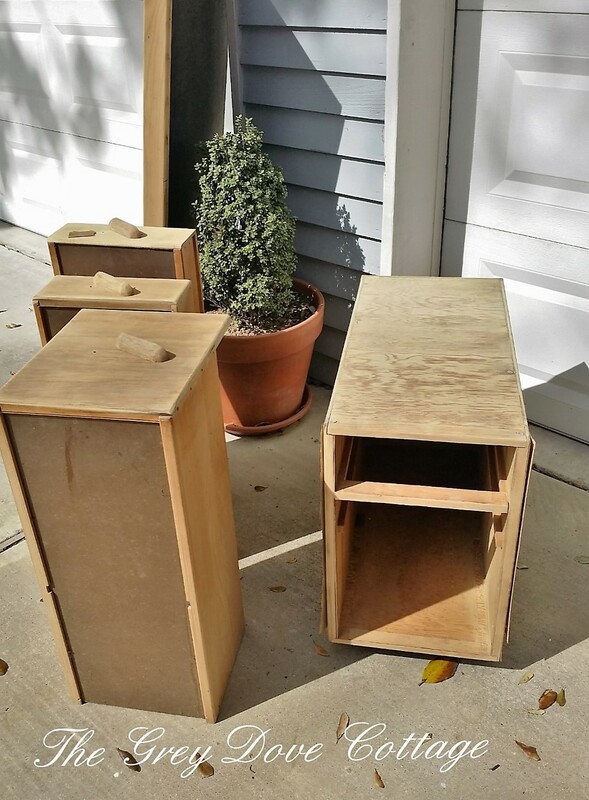 The drawers will provide much needed storage space for office supplies, and projects. See? Gorgeous, and now safe, in a new home, out of the humidity. She turned out well. Honestly, I could use a little "facelift" myself. I am a huge fan of recycling, conserving, and saving. Whenever possible, it is important to preserve what we can for our future generations. Craftsmanship, and ingenuity of years past. I'll show you her new "home", the home office soon. Thank you for stopping by.